Chicago weather has been gorgeous, and my research into great places to eat has paid off. The highlight so far has been the pizza from Gino’s East. Tip: If you can manage it, get there right before 5 p.m. or soon after. We got there and waited only about 5 minutes. By the time we left the line was literally around the building. 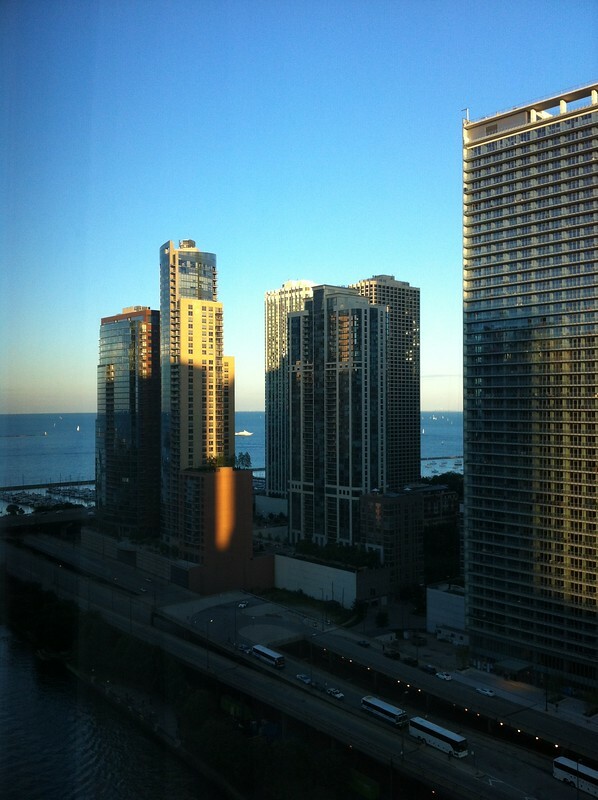 This is the view from the Sheraton Towers room I have overlooking the river. Delicious Baby hosts “Travel Photo Fridays” go there for more travel inspiration. Gorgeous day. I love seeing the boats out there. Pizza sounds so good to me right now. I want to try to make Chicago style pizza when I get home. Nice and buttery mmmm. Love the photo and the city! I have been to Chicago about 8 times and had never eaten the deep dish pizza until I visited earlier this month. And we ate at Gino’s East! My daughter liked the pizza but she LOVED writing her name on the wall! I’ve never been to Chicago but my daughter is thinking of applying to Univ of Chicago this year, so a visit may be in my future! It seems to be a great city. Tons of arts and activity.